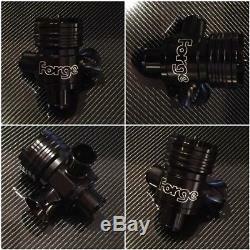 Forge motorsport 1.8T Dump Valve Recirculating Blow off in Black. 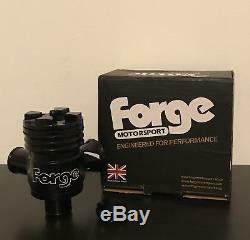 Fits 1.8T Engines Audi A3 S3 A4 TT and VW Models! The Splitter is a truly remarkable valve that gives a combination of blow off and recirculation valve operation, all at the same time, and has been specifically designed for the many turbo engined applications that operate metered airflow management systems. This means you get all the noise of the blow off valve whilst retaining the compatibility with the recirculation requirements of the engine management system. As a bonus we also offer the ability to convert the valve to recirculation only mode for those times when stealth running is required. This valve uses a Brass piston which utilises new sealing technology along with a variable spring preload, incorporating a ratchet type top adjuster that will allow for the positive and precise adjustment to match the valve to your engine. This is achieved by using a unique single, conical, progressive rate spring, that can allow for the retention of boost pressure over a wide adjustment range. This unique spring design also allows for unrestricted piston travel and flow volume regardless of the amount of pre-load adjustment added to the spring. TT > Mk1 > 150/180Bhp. TT > Mk1 > 210/225Bhp. Golf > MK4 > 1.8T. Leon > Cupra 1.8T. Leon > Cupra R 1.8T. The item "FORGE SPLITTER R DUMP VALVE RECIRCULATING BLOW OFF AUDI A3 S3 A4 TT 1.8 TURBO" is in sale since Thursday, October 4, 2018. This item is in the category "Vehicle Parts & Accessories\Car Tuning & Styling\Engine, Tuning & Chips\Other Engine Tuning". The seller is "carbonlover_86" and is located in Clydebank. This item can be shipped to United Kingdom.